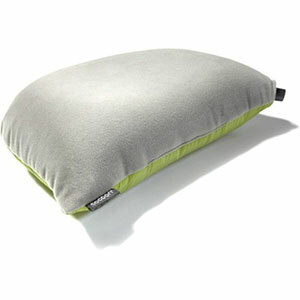 This is a nice lightweight pillow that is comfortable to sleep on and fits nicely into the hood of your sleeping bag. 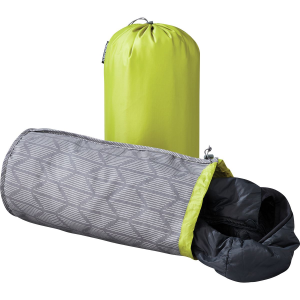 While I have been focused on getting the base weight of my pack down as low as I can (currently it is at about 21 lbs) I am also older, retired, and want to be comfortable when I am backpacking on week long trips, so I am willing to pay a slight weight penalty and carry an inflatable mattress and pillow. For a pillow I considered just using a stuff sack filled with a jacket or fleece shirt as I have done in the past, but I have never been completely happy with that approach. When I am backpacking I can end up spending 9 to 10 hours in my tent each night, and I have found that the more comfortable I am in my tent the better able I am to recover and be fresh for the next day of hiking. While I wouldn't normally pay what I did for this pillow (I'm a little on the cheap side...) I had a coupon or rebate check from REI, so when I went looking to spend it, I broke down and bought this pillow. 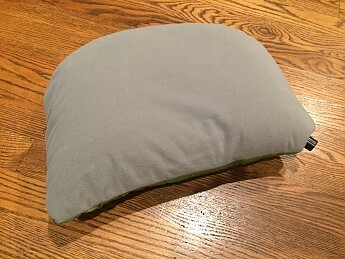 The pillow is well constructed and consists of an outer shell where one side is a smooth lightweight nylon material and the other side is more like a lightweight fleece, and there is an inner bladder that is removable (there is a zipper on one side of the outer case) which allows the outer shell to be thrown in the wash at the end of a trip. There is a standard screw type valve on one corner used to inflate/deflate the pillow. 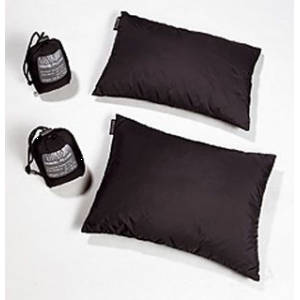 The pillow also comes with a small stuff bag for storage, but I have eliminated most stuff sacks in my pack and would just put the deflated pillow in my sleeping bag before packing my bag in my pack each day. 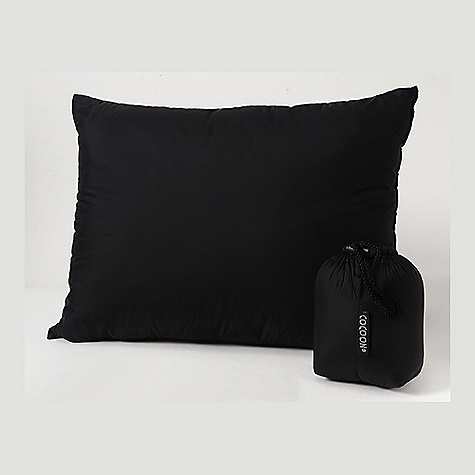 The pillow is about 4 inches thick when fully inflated and I found it most comfortable for me to use it only about halfway inflated as it seemed to better cradle my head when I was sleeping. I have attached pictures below of the inflated pillow and also of the pillow taken apart so that you can see the construction of the air bladder. I like how the bladder is constructed as it has internal baffles that create a pocket at the center of the pillow that helps cradle your head when in use. 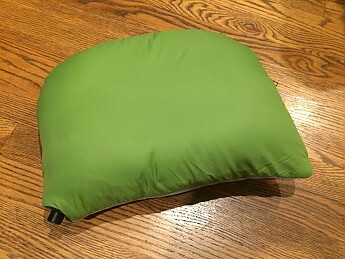 I also have included a picture of the pillow installed in my sleeping bag to show how the curved edge on one side of the pillow fits nicely into the hood of a standard mummy style sleeping bag. 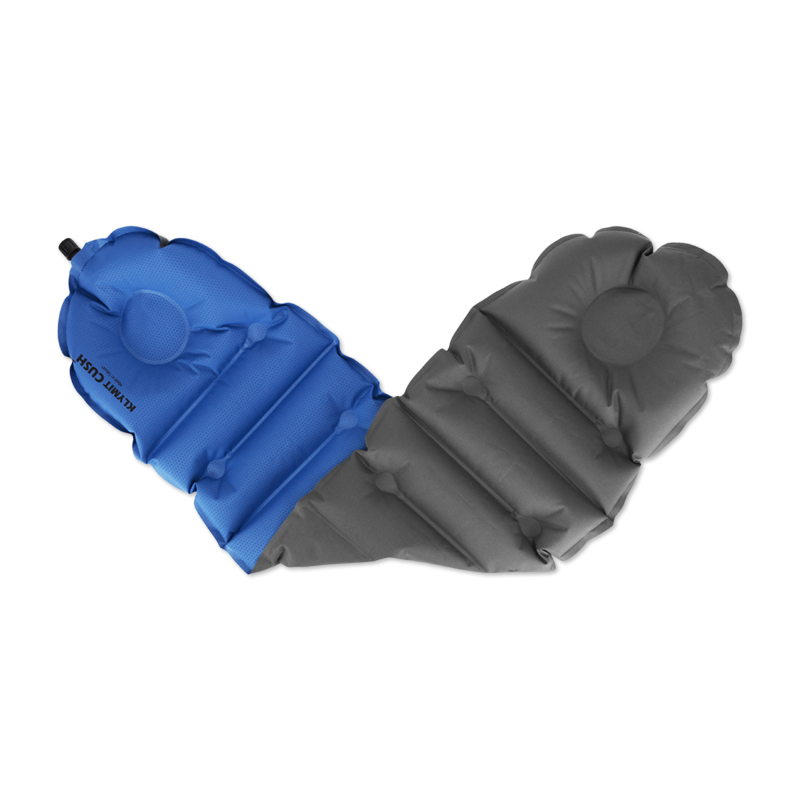 I think that this is an important feature as it allows the opening of the sleeping bag to be drawn closed on colder nights while still keeping the pillow under your head. My pillow with the tags cut off and without the stuff sack only weighs 3.5 ounces which I think is not too bad for the comfort it provides, but for next year I may just use the bladder and sew a very light pillow case to see if I can get the overall weight down by an ounce. 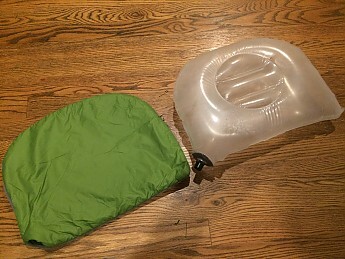 Overall I am happy with the pillow and would recommend it to anyone looking to add an inflatable pillow to their pack. Thanks for the very helpful review, Mike! The Cocoon Sleeping Bag Hood Pillow is not available from the stores we monitor.